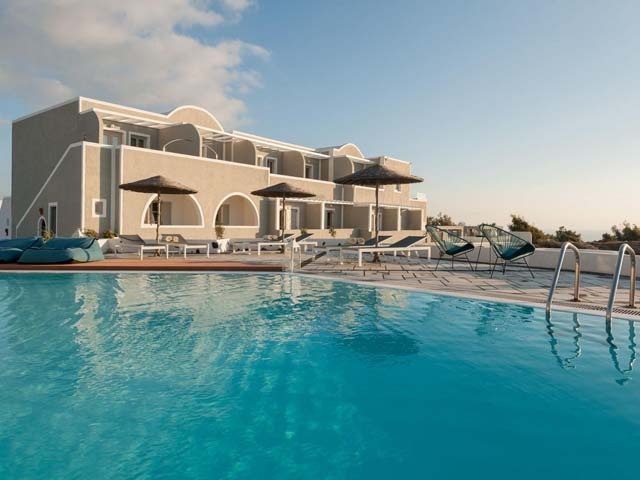 Megalohori is a large area situated on the south western part of Santorini island. The geographical terrain is quite varied. 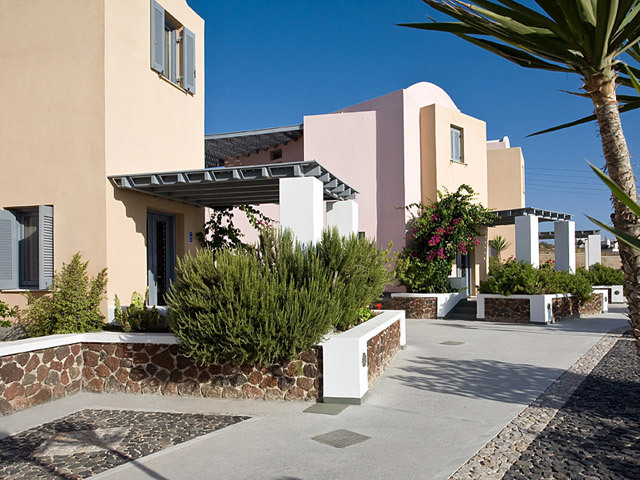 In some part open stretches of land, in others dotted with clusters of local houses. It also reaches right up to the Caldera basin (the volcano). That's where we are, perched on the cliff side, with views unsurpassed by any stretch of the imagination. 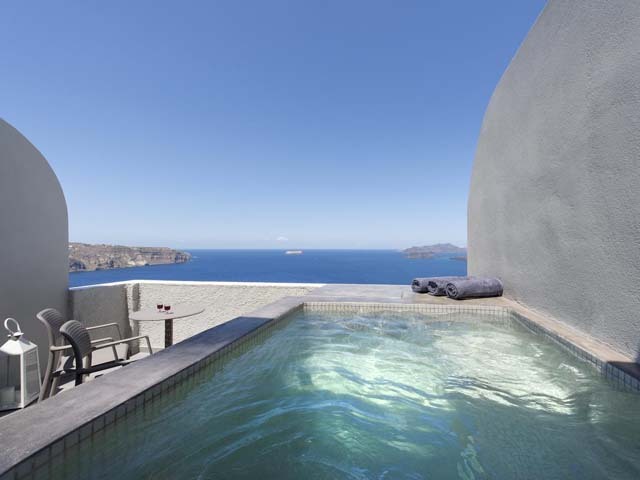 It's just one of the benefits of staying at Caldera's Dolphin hotel. 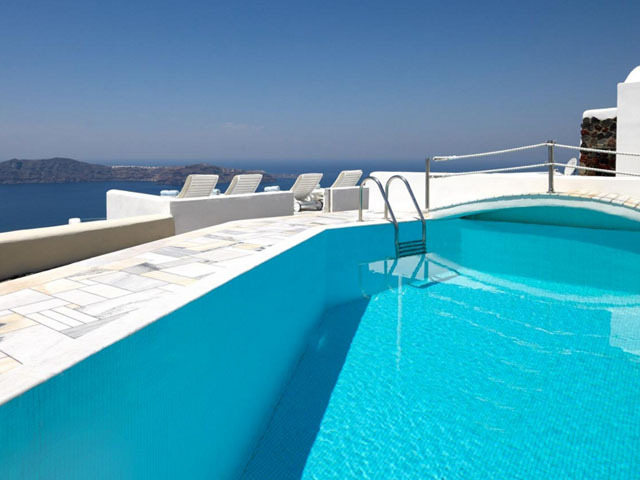 Caldera's Dolphin Suites | Accommodation at Megalochori in Santorini. 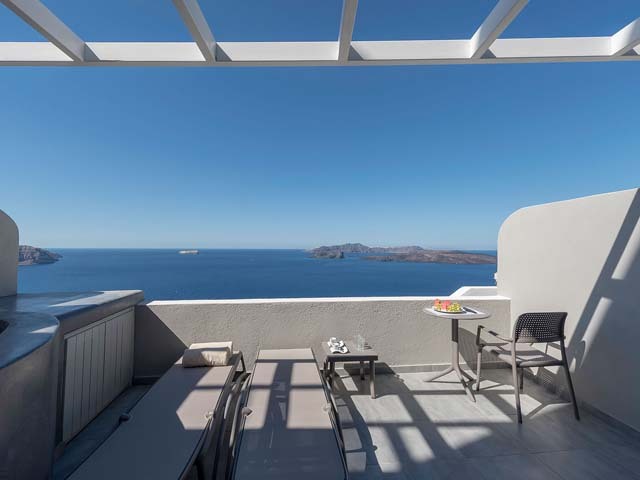 Caldera’s Dolphin Suites is located on the cliffside of Megalochori village offering a panoramic view of the Santorini caldera, volcano and the sunset. 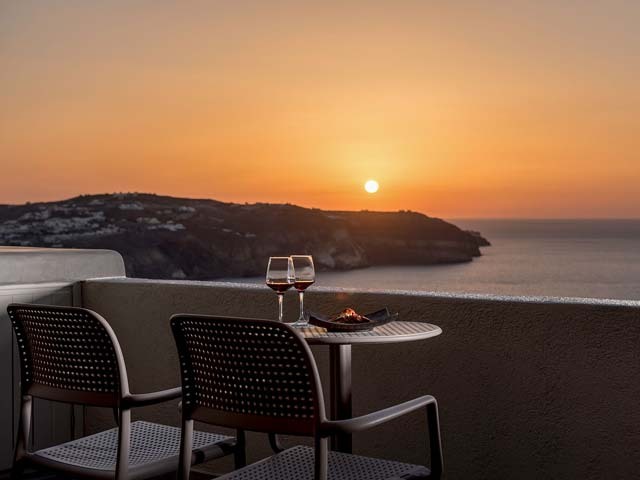 Caldera’s Dolphin consists of 5 Superior Rooms, 5 Junior Suites, 2 Deluxe Junior Suites, 1 Honeymmon Junior Suite and 1 Two-bedroom Suite, all of them with private balconies featuring caldera and sunset views. 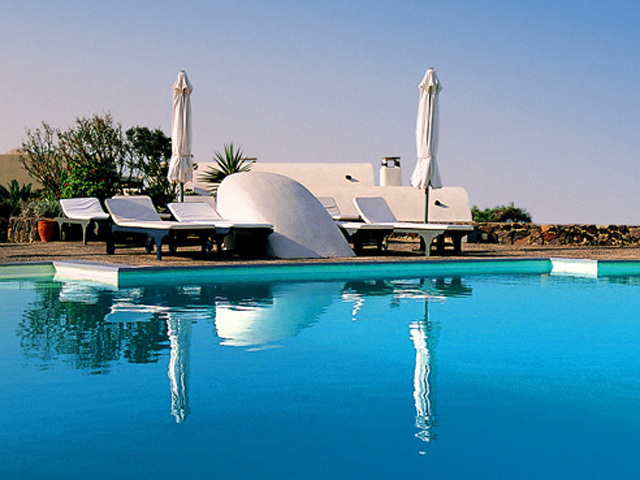 - the warm & sunny weather, hospitable people, wide choice of available wedding services and views - views, which will create the perfect backdrop to your wedding photos. 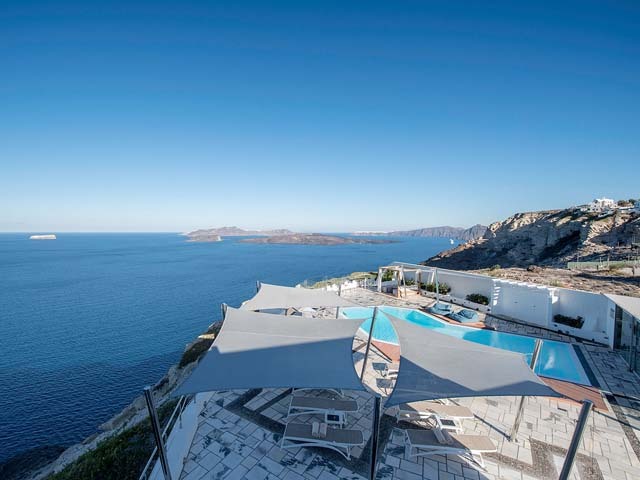 Calderas Dolphin Suites is proud to present our brand new Wedding & Events area - a unique space of 500m2 with majestic views over the caldera, the volcano and the sunset. Equipped with the latest technologies and offering all modern conveniences so that you and your guests can feel comfortable and enjoy the event of your dreams, our Wedding & Events area offer comfortable seating for up to 120 people. But you don’t have to stop at that - invite all your friends and family to be part of your special day by live streaming the ceremony using our webcams and elevate the experience even further by using the video conference feature to truly increase the feeling of being together. The Wedding & Events area is also ideally suited for a wedding reception or any other event, including sit-down dinner, providing bar & buffet space for catering, DJ & dancing area, parking, restrooms and all other facilities. We and our collaborators cater for all size events – from the most intimate to maximum dining capacity of 120 people. Our experienced staff will be happy to assist you while planning the event of your dreams - be it a wedding or a special birthday party. 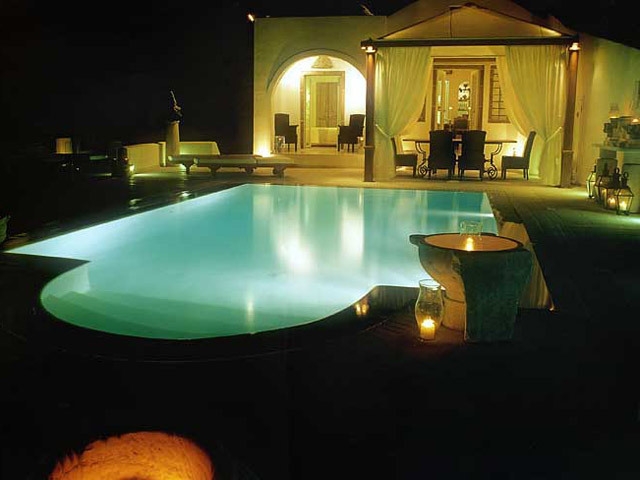 We will be by your side throughout the planning process and the big day itself to ensure that all your wishes come true! Facilities: 500m2 open air terrace with caldera, volcano and sunset views Maximum capacity 120 people, optimum capacity 80 people Ceremony table Webcams to provide live streaming of the event Video conference feature for two-way communication Music speakers throughout, dedicated DJ space Bar & Buffet area Dedicated space for dancing or performances even at maximum capacity Restrooms with WC and shower Parking space Due to proximity of hotels, all events must conclude by 23:30. Caldera's Dolphin Food & Wine bar offers a selection of snacks and fresh salads all day long! Start your day with our a la carte breakfast which is served at your private balcony or by the pool area. 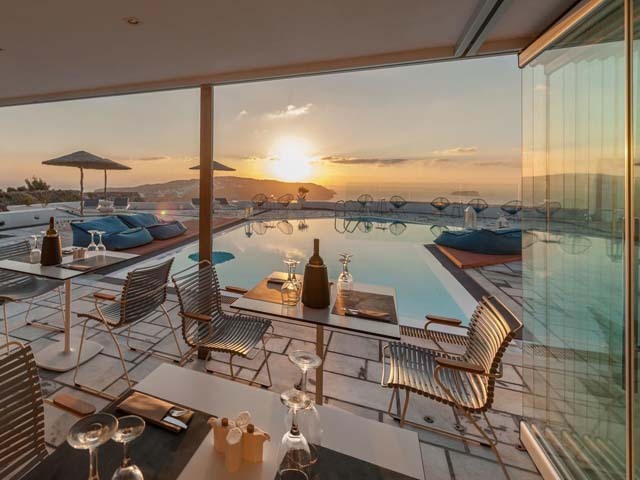 Throughout the day you can enjoy refreshing drinks by the pool or in the cozy bar area and, when evening comes, a tropical cocktail or a glass of Santorini wine will set the mood while you enjoy a magnificent sunset.